Following hard on the heels of Nick Wakelin’s award for the gardens our railway has just picked up not one but two accolades in the Herald Express Tourism and Hospitality Awards. These were in two different categories: Best Visitor Attraction and Best Café/Tea Rooms. 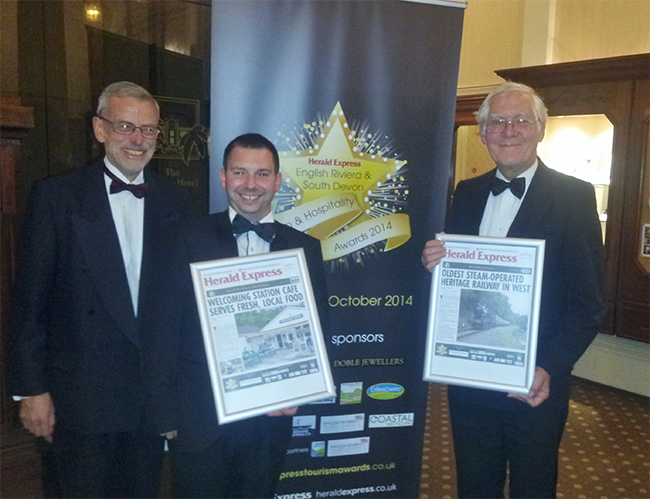 Three key parts of the railway were represented at the award ceremony at the Palace Hôtel Torquay last night. Catering Manager Graham Coates attended on behalf of SDR Plc and the Refreshment Rooms, chairman Alan Taylor represented the Trust and Association president Richard Elliott attended on behalf of the Association and volunteers. They were delighted to pick up the Silver Award for Best Visitor Attraction and the Bronze Award for Best Tea Room. Richard and Alan both commented that this was a very creditable achievement as it was the first time we had been entered, reflecting the hard work, dedication and enthusiasm of all volunteers and staff throughout the year. Graham said that the award for the Tea Rooms was a fitting tribute to all his staff and volunteers who often do far more than is expected of them.